A thing bugging me at the moment is the lack of information on the possibility of finishing a point cloud based 3D model in a desktop software(e.g. Solidworks, Geomagic Design), exporting it in a measurable format (i.e. no meshes or point clouds, but solid bodies, so .sldprt is basically the only one I can export from Solidworks with the textures automatically included), and combining it with map information in WebGIS. For the establishment of my WebGIS, I plan on going the open source way, so a PostgreSQL database and GeoServer are in the picture. Is there a possibility of including a finished solid model into a WebGIS using open source software? I haven't found a way which enables me to combine my model with a location, e.g. using OpenStreetMap or a specific WMS service. I know Google Earth has this possibility by uploading a model to the 3D Warehouse, but I can't interact with the model the way I want to there, e.g. measure it. Of course I can do all this in 2D, divide the data into layers and overlap it with map information, but I am really interested in doing it in 3D. To get a more specific idea, I have a gas station model made based on a point cloud, with a lot of pipes, boxes, tiles, stairs, etc., which I would like to place to its real spatial position. This is an attempt at a general answer on the question of whether it is possible to store 3-D models (indeed models of greater than 3-D) in some data store and access those models through the web, all whilst using open source software (and I'll throw in open standards too). 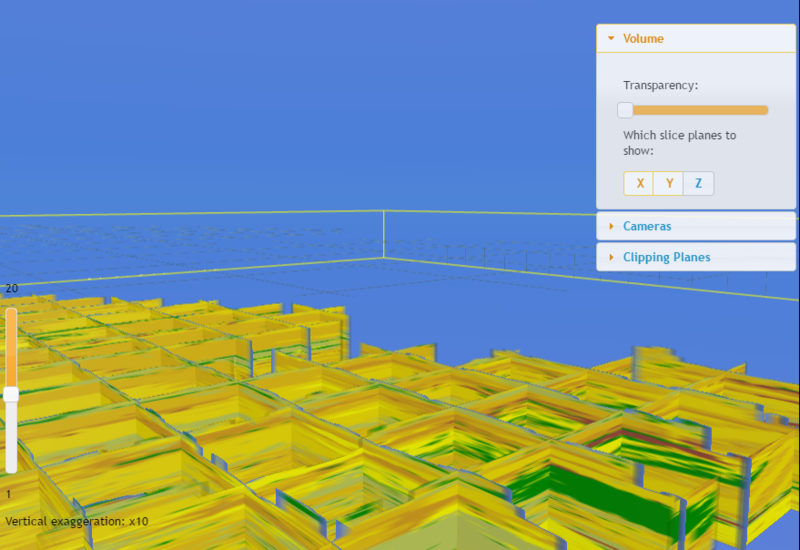 We were involved in a project (EarthServer) that attempted to do just this, we even looked at using point cloud data directly, and the answer is, generally speaking, yes, it is possible to provide access to 3D models through a Web GIS. Server s/w: CentOS Data store: Rasdaman (community edition), sitting on top of PostgreSQL (our database had 18TB of data on it, which was one of the smaller implementations across the project partners). Data was requested using OGC Web Coverage Service (WCS) and Web Coverage Processing Service (WCPS) standards, through a Petascope (part of Rasdaman) based service. 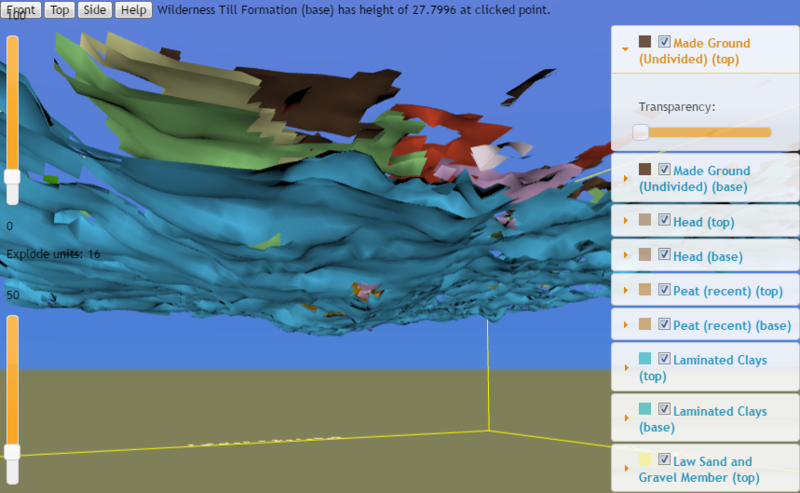 So for example in the below image, we are pulling multiple geological surfaces from our database using WCPS queries, and creating a 2.5-D (some call this 3-D) model in the browser. The model rotates, you can zoom in and out, you can explode the surfaces, you turn surfaces on and off, and you can do a point and click and return some information (as shown at the top of the screen). In these (below) examples, the stored data is a voxel model of lithologies. The approach we take here is to slice up the model into a series of X,Y,Z planes and construct our visualization that way. This image shows the same surfaces with the Z surfaces turned off. This variant shows the same model but here we have clipped the model (through the GUI) to lose some of the planes. Not the answer you're looking for? 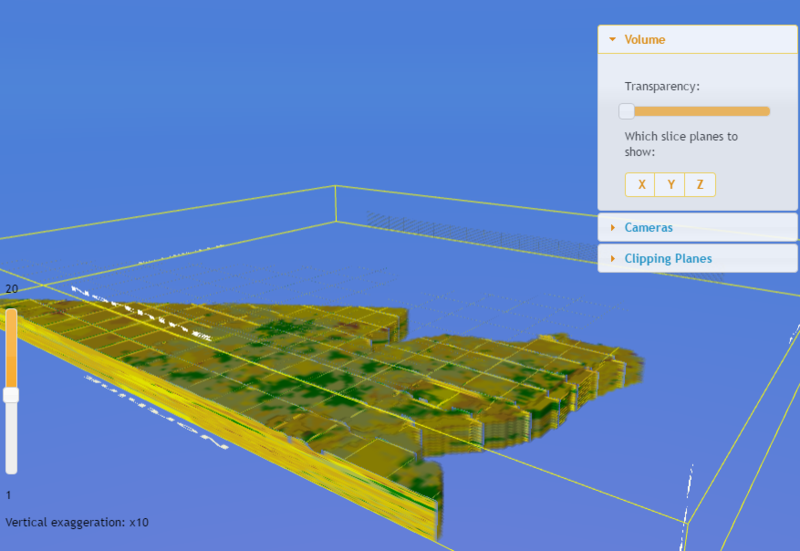 Browse other questions tagged open-source-gis 3d-model web-gis or ask your own question. What are some affordable hosting services for a webgis using? 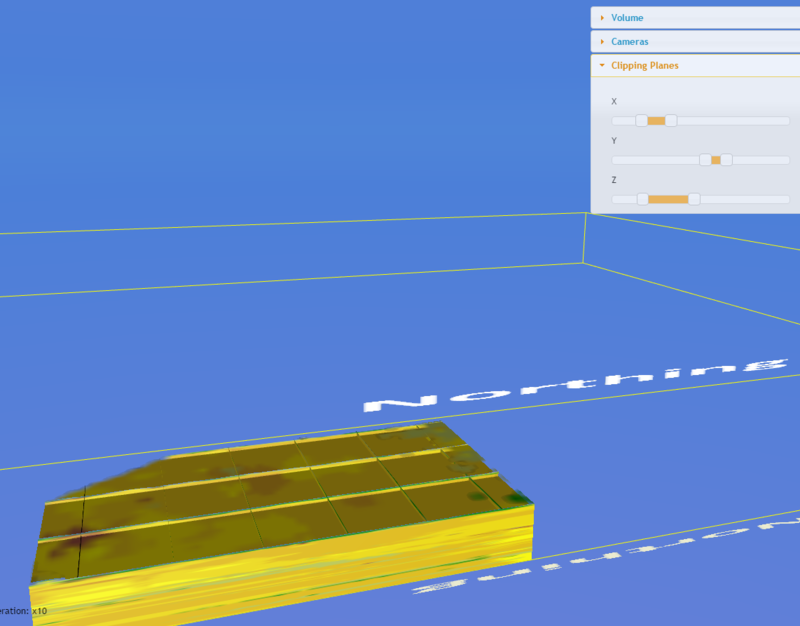 Creating equirectangular projection from 3d spatial model? Create an offline version of layers in ESRI WebGIS?